We are open from the beginning of March for short breaks, weekly, fortnightly or longer holidays. Elm Beach is a quiet park with no entertainment or amusement facilities but instead offers our guests unrivalled peace and tranquillity. If you are looking for a relaxing haven where you can "chill-out" and recharge your batteries, look no further than Elm Beach Caravan Park. 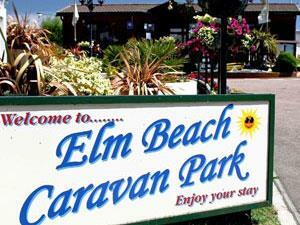 Our aim is to provide you with a friendly atmosphere from the moment you arrive and all through your stay with us here at Elm Beach Caravan Park. Whatever you want from your holiday, whether it be the bright lights and attractions of Great Yarmouth, the peaceful tranquillity of the Broads or Caister's clean, safe golden beaches you'll find Elm Beach provides you with the perfect base from which to explore the delights Norfolk and Suffolk have to offer. Elm Beach is situated within easy reach of historical Great Yarmouth with it's wide variety of attractions, venues and events to keep every member of the family entertained. The Britannia and Wellington Piers and theatres, crazy golf, Sea Life Centre, greyhound, stock car and horse racing and the world famous Pleasure beach to name but a few. 3 Bedroom detached holiday bungalow, fully equipped and luxuriously furnished throughout. Sleeps up to 6 people and situated in a quiet position just a stone's throw from the beach. The region is easily accessible by road from all parts of the UK. Major trunk roads into Norfolk are the M11, A11, A12 and the A14 from London and the South-east, while the A47 and A14 serve the Midlands and the North. On approaching Great Yarmouth follow signs for the A149 to Caister-on-Sea. Turn right into Beach Road, 3rd turning on the left is Manor Road.